Programmatic Advertising Keeps Getting Better. Here's How You Can Use It. Programmatic Advertising Keeps Getting Better. Here’s How You Can Use It. In the old days of media buying, when your company or agency dealt with publishers individually, deals varied from publisher to publisher. If you or your agency knew someone at a publication, chances were good you’d get a price break. Without such a connection, though, you were out of luck. Programmatic advertising makes media buying much more efficient—marketers don’t have to pick up the phone and renegotiate every time they want to adjust their media buying spins. 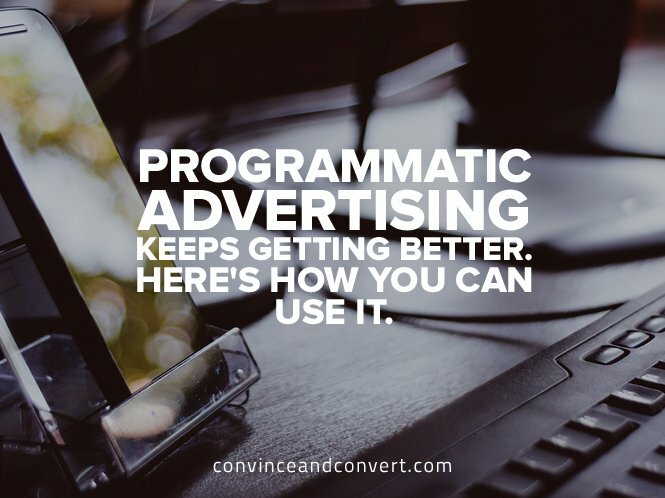 No one believes the programmatic process is perfect. But eMarketer predicts it will comprise 67 percent of all digital display ad spending (that’s more than $21 billion) this year alone—an increase of 8 percent from the $15 billion it accounted for in 2015. With numbers like that, marketers can’t afford to be behind the curve on the following emerging trends in programmatic advertising. Consumers are ending their cable TV subscriptions in droves, and marketers need to find new ways to reach them. The solution is to follow these lost subscribers with video advertising on applications and media that run on smart TVs and connected devices, like Roku and other streaming players. One cool thing happening in this space is that marketers can increasingly use programmatic video for simultaneous messaging across screens. For example, during the Super Bowl, a user might see an ad for GoDaddy and then check social media, only to see the same video. When he watches YouTube later, he sees it again. This kind of reach is a marketer’s dream, and as programmatic video increases, it’s becoming a more common reality. Programmatic helps imaginative executions come to life in ways that would have been impossible to pull off in the past, allowing brands and agencies to scale to specific audiences across devices and planners to forecast availability for media planning. Of course, while programmatic marketing is the way of the future, that doesn’t mean it’s infallible. When robots buy media, some of it’s going to be bad. One downside is that the system can be gamed and the buyer exploited for maximum value. The ecosystem detects bad actors—ad networks, publishers, bot sites, or foreign entities—whose only objective is profit. Ultimately, they’re weeded out, but not before money is wasted. Thankfully, as programmatic matures, more marketers, publishers, and the exchanges themselves are using tools to measure the viewability of ads. As the technology improves, companies will have more control and can insist on only paying for ads that are actually seen by users. In some ways, media buying is also regressing back to the days of handshake deals and old-fashioned networking. In spite of that system’s obvious issues, it did allow marketers access to the inventory they wanted. We’re now seeing a gradual shift toward using programmatic advertising in a similar way. Rather than commoditize their inventory on an open exchange, many publishers set up private auctions and packages of inventory that can be purchased directly. When a certain type of inventory lets you achieve your campaign goals, you can set up private deals for just that kind of inventory. This mitigates your risk of being subjected to an open auction, ensures a predictable number of visitors, and represents a win-win for all: Marketers can efficiently access the inventory they want while guaranteeing a fair price; publishers only have to interact with brands they trust at certain price thresholds. One of the frustrations with programmatic has been marketers’ need to fit their goals and metrics into those provided by a third-party system. Particularly for larger buyers, this can cramp a campaign’s style, making it hard to measure its true effectiveness. The good news is that marketers are gaining more control over optimization and bidders. Beeswax and AppNexus, for example, both allow you to design your own bidder. With these tools, marketers can fully design and create their own campaigns, launching them in just the way they think will be most effective. The logic by which your campaigns optimize shouldn’t necessarily come from off-the-shelf solutions. Not all companies value the same metrics, so take control over how your bidding system operates and how your campaigns target and refine themselves. The advertising industry continues to experience boom-and-bust cycles, just like the rest of the economy. As macro trends continue to play out, inventory and demand consolidate and then dissipate. Publishers and advertisers release control to other players, then desperately grab for it. More dollars will migrate from traditional media buying in video to programmatic, up to a maximum point. Even at 100 percent saturation, the “upfront” will still exist. Until that point is reached, expect quarter-on-quarter double-digit growth for the next 36 months. Publishers will see improved yield on their supply as access to brand dollars becomes more liquid. Advertisers will see a decrease in CPMs as programmatic flattens the playing field and weeds out middlemen like sales houses and sales executives. Over the next few years, I expect to see more marketers exerting more control over how data is used alongside their billing in order to customize their bidding systems. If you want to capitalize on these trends now, start setting up guaranteed private deals, use third-party services to monitor effectiveness, and gain control of your bidding system. Marketers and agencies alike should focus on direct access, transparency, and consolidation to avoid being left out in the cold in the new media buying landscape. Hagan Major is president and chief operating officer of YellowHammer, a New York City-based performance trading platform that provides programmatic buying solutions for advertisers and agencies that demand a tangible return on their advertising dollars. As COO, Hagan is responsible for YellowHammer’s corporate strategy and internal operations.